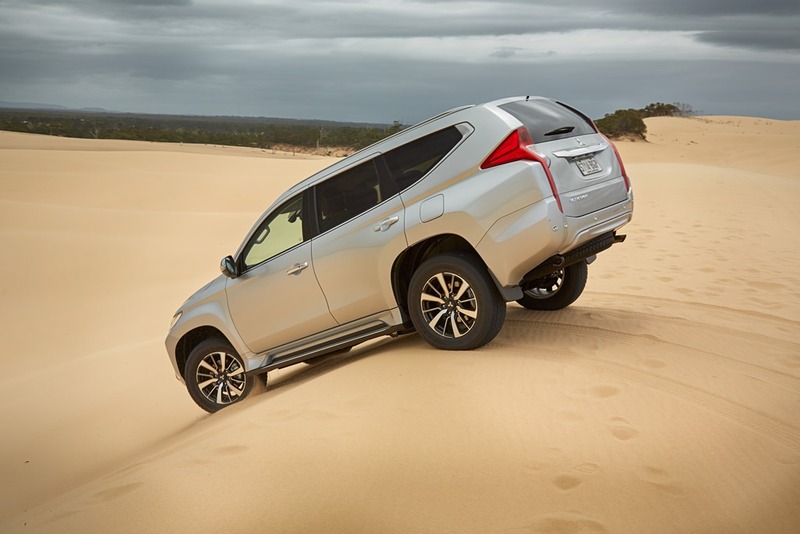 Mitsubishi was so confident its new 5 star rated SUV would kill anything thrown at it, they confidently plotted a course through sand, dirt, rock and gravel that most of us would have a hard time walking on. Firstly: Pajero Sport has nothing to do with Pajero, but rather replaces the aging Challenger in fairly spectacular style. The front end looks modern with LED daytime running lights and a sweeping “shield” grille and headlight display. The side profile also has a dramatic sweep up towards the high-set rear end. It has the look of a Triton with a canopy, and justly so. The rear lights look striking but the canopy affect may take a little getting used to. At first, that which appears very strange, grows on you after only a little while. 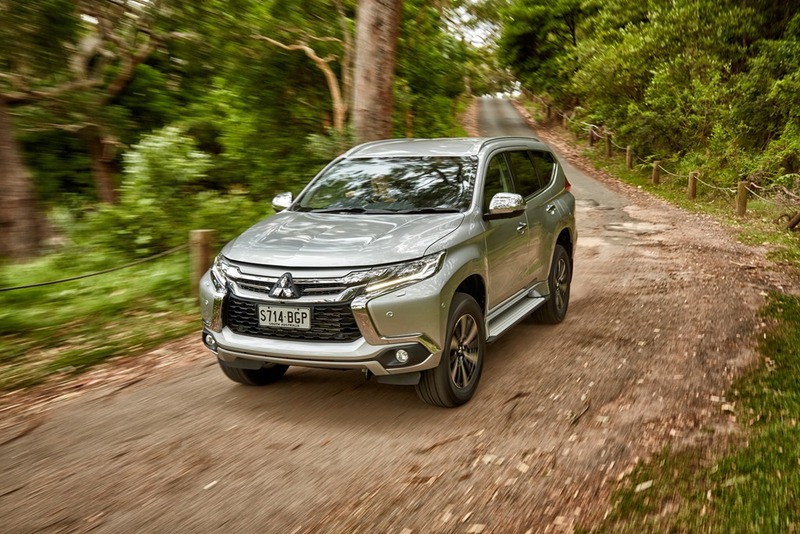 The 3 trim levels are not immediately obvious to anyone not a Pajero Sport aficionado. 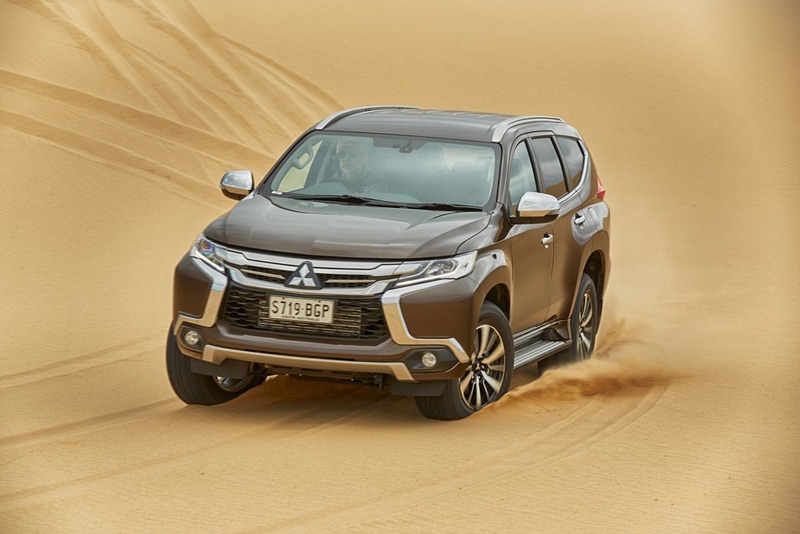 Pajero Sport continues Mitsubishi’s trend of not badging individual levels. Apparently it is some kind of reverse snobbery where only the owner knows he has the top of the range. Personally, I’d rather everyone knew I’d handed over many extra shekels for a shiny new Exceed over the base GLS. Inside, the cabin feels tasteful and well-appointed. 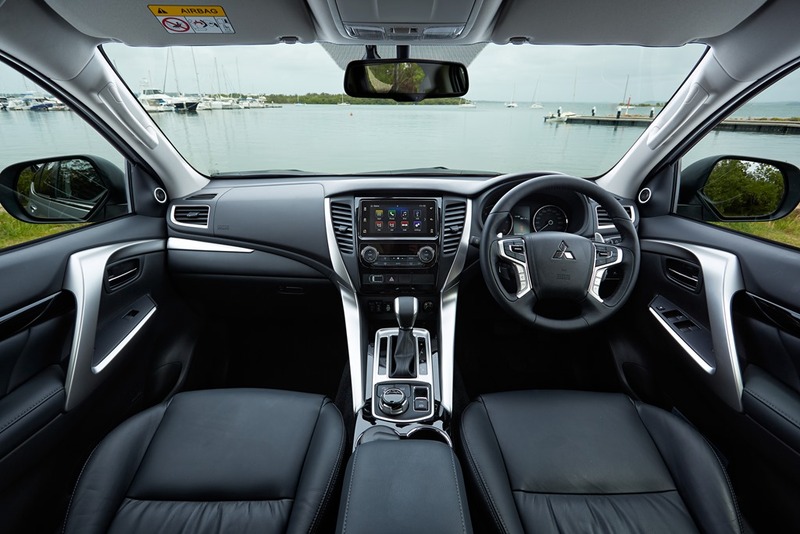 Mitsubishi claims the cabin has a luxurious premium feel and I agree, it feels like quality. The plastics have a premium look and feel. The touches of metal and leather add a certain charm. Some of the metal trim is plastic so only time will reveal its true longevity. 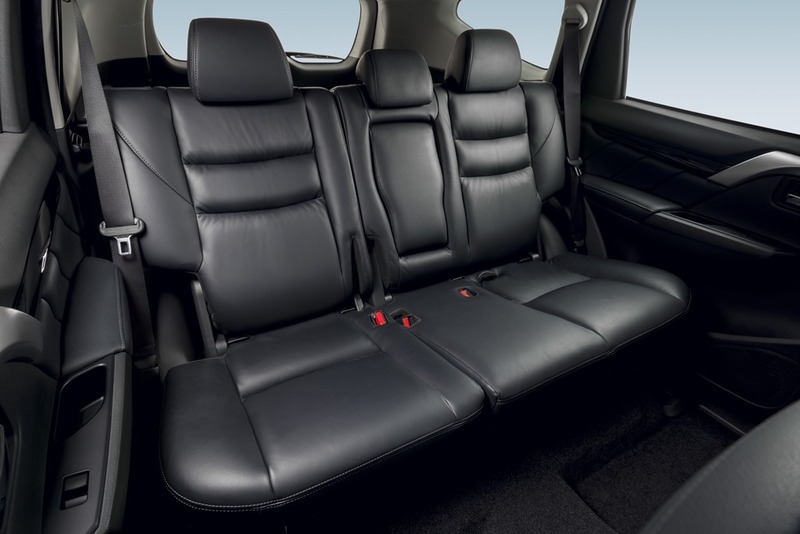 Only the base GLS misses out on leather but even it leaves a classy 1st impression. 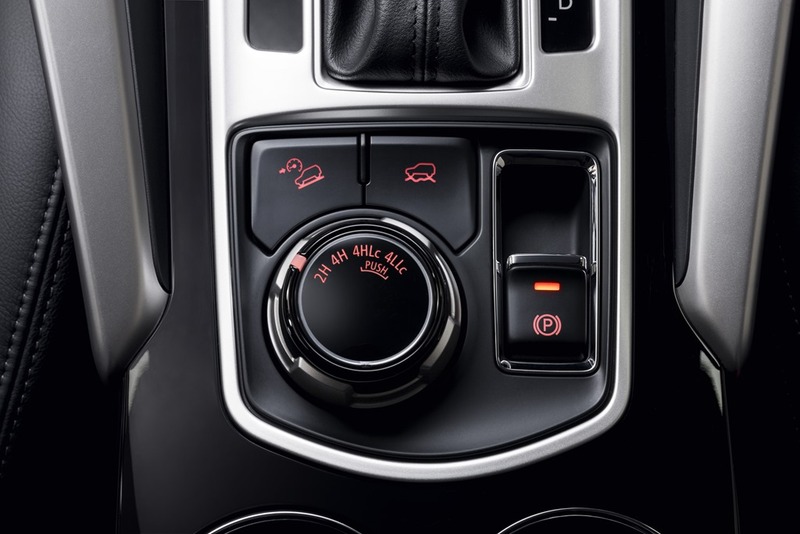 The first thing you notice is a bunch of off-roading buttons which I encourage you to get out and use. The most fun you’ll ever have sitting down. The next thing is Mitsi’s brilliant audio system. The CarPlay uses Siri to perform much of the function normal voice control can’t manage. The system only works by cable but will also run Android phones. Hit the voice button, ask for an address, then demand to be taken there and off you go. When you plug your phone in, there is no need to pair, punch in PINS or otherwise faff about. The Apple apps are mirrored and the best by far is the “Messaging”. More and more, dim-witted nongs are being distracted by texts and ruining lives in the process. A car travels a long way in the time it takes to reach down to answer a SMS. With CarPaly it is all done via Siri with a voice reading the texts, and answers being given just by speaking to the car. While plugged in, the Apple functions of the phone are disabled. Non-Apple apps are not affected. It is genius. Of course this isn’t exclusive to Mitsubishi, but Mitsubishi is a very early up-taker of such handy tech. It’s worth noting the Sport is sans the 3rd row of seats oft touted as a must have. The Mitsubishi boss says it allows for more luggage space, and so it does. Let’s face it, queens are mean shoppers so why buy a car with 7 seats, 2 of which will never be used. You pay for something that takes up a lot of room which could be used for useful things like luggage, dogs, or presents (for me). 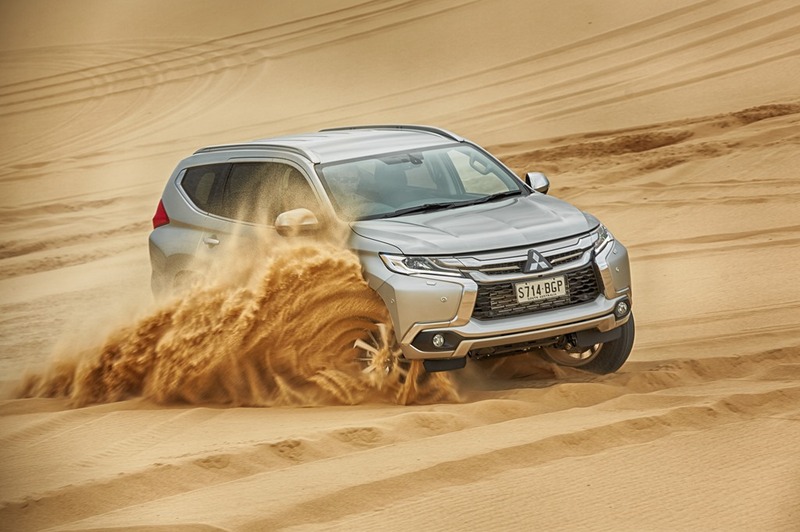 The drive is where the Pajero Sports comes out of its shell. There is only 1 engine and transmission to be had: a Euro 5 2.4L 133kw/430Nm MIVEC turbo diesel mated to a new 8 speed AISIN automatic transmission. This gives around 8.0L/100k from the 68 litre tank. You should be able to cover a Sydney/Melbourne trip on a single tank with some left over for good measure. In a stroke of theatrical brilliance, the Mitsubishi PR team started the proceedings on the wonderful Stockton Sands. Who knew such a place existed with many tens of kilometres of shifting dunes 20 metres high. Many of the slopes of fine sand are far too difficult to walk up but the Pajero Sport managed it easily. We set off through the desert scenery looking like a modern Lawrence of Arabia camel train. If, like me you’re a complete novice in a 4WD, you’d have appreciated my co-driver to whom this is second nature. His instruction was simple, concise and succinct. It feels strange to be sitting in what feels like a lounge room speeding across sands dunes. Oddly, the few dozen cars were led by a Pajero like a mother duck and her brood. No slope was too great and no drift too deep. 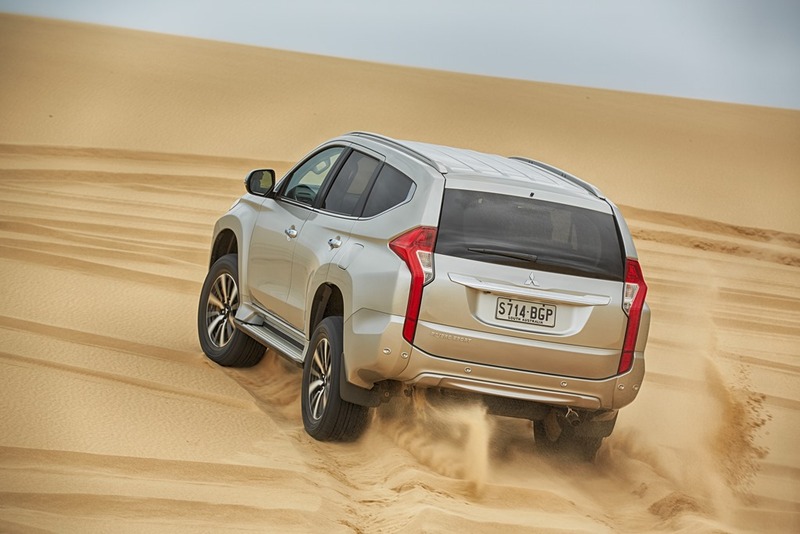 The sand setting, and tyres at 16psi made the Pajero Sport dance on the dunes. In many ways this alone is worth the purchase price, but I fear few will ever experience this magic. This is one of the rare times I was told to switch off the traction control. I’m reliably informed braking is the enemy of sand driving. We powered up steep dunes, across the top then down the other side which was equally taxing. It is un-nerving to see the ground fall away so sharply, then to plunge down in complete safety allowing the car to do its thing. Remember these cars weigh over 2000kg, but scamper down the slopes like giddy school girls. 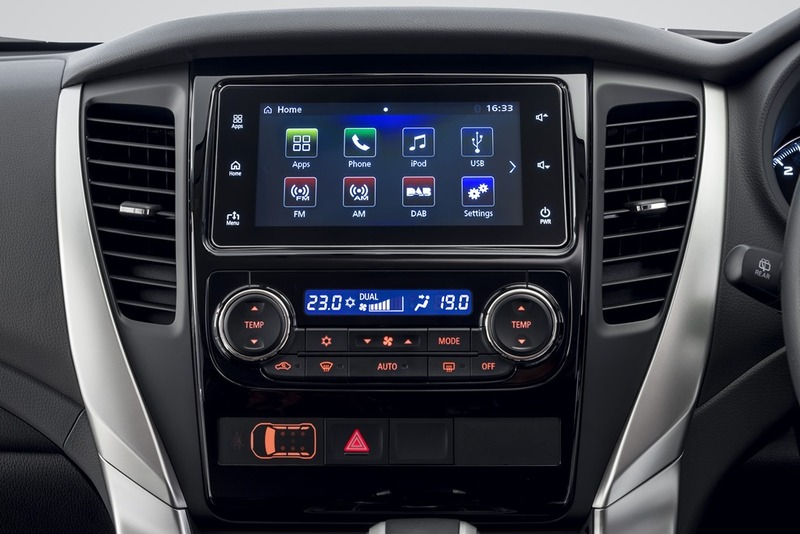 As on the road, the electronics make a very average driver feel confident. Next day it was mountains, rocks, gravel, and the odd muddy puddle where the Pajero Sport proved as competent as it had on the dunes. The 218mm ground clearance is measured from the bottom of the diff which is the lowest point of the body. This becomes more important as the terrain becomes more hostile. The selectable terrain control, along with the 2wd/4wd/4wd HLC and 4wd LLC, mean the electronics can be manipulated through varying degrees of terrain as it gets more challenging. It isn’t a matter of selecting a mode then leaving it there. 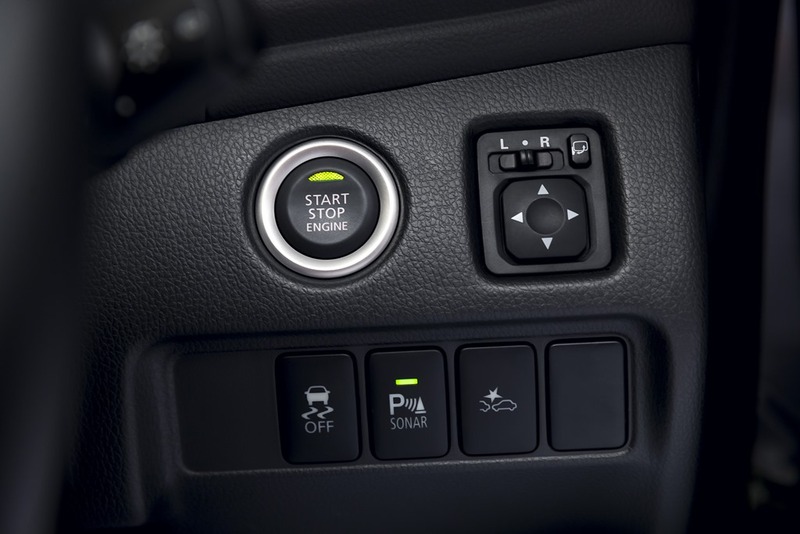 Instead, you can shift between modes and driving wheels, and even select Hill Descent Control to help. Doing it this way means you leave a little in reserve for when things get really eggy. Tackling a slippery gravel track is a doddle with the ABS cutting in to control the rate of travel. Touching the accelerator takes over from the electronics, like with Cruise Control. And like Cruise Control, lifting off the accelerator returns control to the electronics again. It is genius and much easier to use than the confusing raft of buttons and labels would have you believe. The only thing to remember it not to leave the diff locked on tarmac. Other than that, experimenting with the terrain and 4WD selections opens a world of choice. After a chort while you get a feel of what each mode will do. While off road, remembering a few simple tips will help make things a bit more controlled: Never put your thumbs inside the steering wheel, and follow the tracks of the person in front. If the steering wheel bucks for any reason it will break your thumbs. Following in the tracks of the person in front means if there is a mistake to be made, it won’t be made by you. The most notable thing about the cabin is that even frantic with activity, the ride is reasonably smooth most of the time. Of course navigating a stony creek bed or deeply rutted dry mud track jostles the occupants, you may well feel stirred but never shaken. To prove this, a small hamper of bottled goodies was left on the floor in front of the back seats. None of the bottles broke even under extreme duress. By now the “caravan” of vehicles was covered in schmutz, but after a morning climbing mountains, we simply rolled out onto the tarmac. We drove down the highway to Sydney as if we had never left the bitumen. 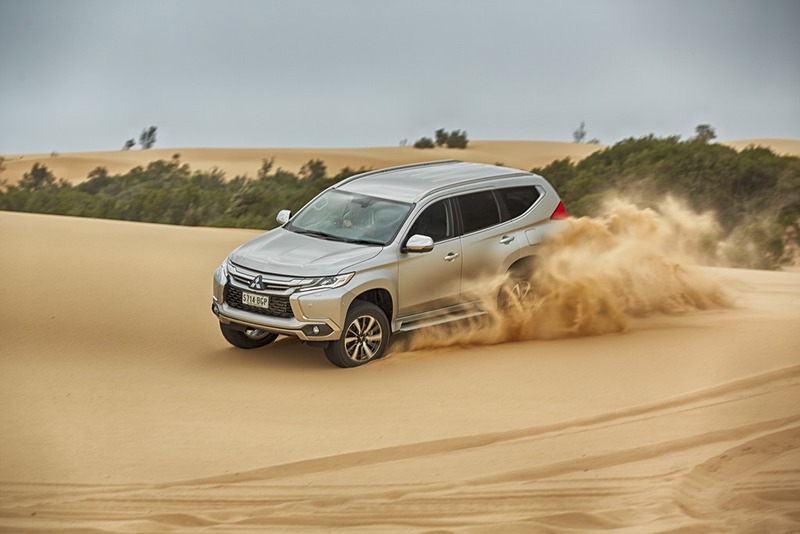 In a felt unreal to think in the space of 24 hours, the Pajero Sports had been doing playful doughnuts on towering sand dunes, bumping along precarious tracks on precipitous cliffs, and moving swiftly along potholed gravel roads. Despite the fact that losing control would have been disastrous, the cabin felt safe and secure and above all, comfortable. One might suspect a vehicle that could tackle any terrain in a single bound might be ham-fisted on the road, but not a bit of it. It’s true that some SUVs are diabolical on-road, the Pajero Sport is not. It feels car-like which is as well because that’s where most of them will spend most of their time. We’ll have to leave the carpark maneuverability assessment for another time. 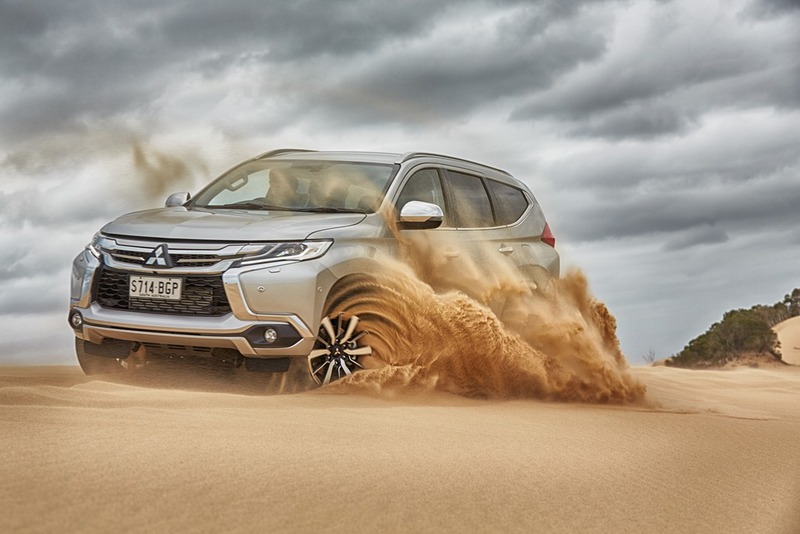 Our brief few days on fine sand, vicious rocks and steep mountains showed Pajero Sport to be agile and capable. I like this car, I like it a lot. Apart from the rump styling, there isn’t anything I’d change. Would I buy one? Yes. 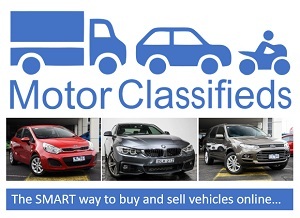 It is good value with plenty of tech and a great drive.